It’s always been a surprise to me (and plenty of others) that Alsace has never had a first-class wine salon of its own – the kind of forum that serves as a showcase for the region’s finest. 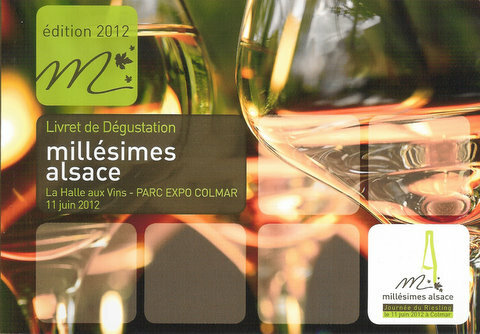 Yesterday, with the first edition of Millésimes Alsace, that changed. The day was titled La Journée du Riesling and featured exclusively that variety. Fifty-six producers, the majority from the Haut-Rhin (the southern half of Alsace) and a select few from the Bas-Rhin (the northern part), all of them profiled in the leading wine guides (Bettane & Desseauve, Gault & Millau, Revue des Vins de France, Parker), assembled at the Parc Expo in Colmar to strut their stuff. And pretty good stuff it was too. The difficulty lay in deciding where on earth to begin – not to mention where to end. With each producer presenting 5 or 6 Rieslings apiece ranging from young, entry-level wines to Grands Crus with a bit more bottle age, there was no shortage of choice. I’m always tempted at such events to stick with the people I know. But that would have meant visiting about three-quarters of the producers present, and time (and my palate) argued against that. Instead I ruled out the domaines and wines that I already know and admire (while taking great pleasure in saying hi to many good friends) and made a beeline for those whose wines I’m less familiar with. The event – beautifully organised and laid out – made this easy. The 56 tables were lined up in neat rows in a large, roomy space, clearly labelled, one table for each producer. The printed catalogue (cover pictured above) gave 2 pages to each producer, with a column for each wine + vintage/vineyard (named or Grand Cru)/terroir type, and some room for tasting notes/private doodles. The focus on a single variety – Riesling – was a good choice, and an unusual one for Alsace. Newcomers to the region are often surprised to learn that almost all producers here work with all 7 permitted grape varieties (Pinot Blanc, Sylvaner, Muscat, Gewurztraminer, Pinot Gris, Riesling, Pinot Noir). When you make an appointment to visit them at the winery, they usually want you to taste the whole range. The organisers of Millésimes selected Riesling alone for this first edition because a) it expresses perfectly and excitingly the extraordinary patchwork of terroirs present in Alsace, b) Alsace wine makers have had centuries of practice with it and c) Riesling is the region’s calling card, capable of setting the pace for all other white wines in the area. I’d add a fourth reason – in full agreement with Jancis Robinson (who was also present) – that Riesling is the most exciting and distinctive white grape variety in the world, streets ahead of its closest rival, Chardonnay. Aided and abetted by a timely article by Thierry Meyer of Oeonoalsace.com on what characterises a good Riesling – and what makes a great one – I asked in each case to taste just two wines: firstly a Riesling that in the grower’s opinion best demonstrated the pure varietal character of the grape (freshness, fruit – especially citrus – and flowers). And secondly one (okay, sometimes two) that showed to special advantage the particular terroir where the wine was grown. Varietal freshness versus vineyard complexity. For Alsace, as a way of distinguishing itself with a selection of representative Rieslings, it was an excellent initiative. For me it was an instructive morning, an opportunity to discover new wines/producers and a great way to get a sense for what this distinguished grape variety can offer when planted in a range of different terroirs, and in the hands of a variety of wine makers.